in your mouth and in your heart that you may do it. 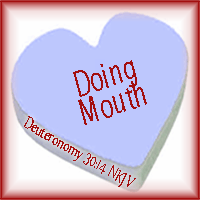 A Doing Mouth speaks forth God’s word and encourages the mind and heart to perform it. one that speaks and does Your word. I want to have a mouth that speaks Your word in the all situations I face. I want to have a mouth that does what You desire. I see I can do this, for Your word is very near to me. It is in me and I just need to cultivate a “do it” attitude that will speak that word out or do it, whenever I am given the opportunity !